Kuvings Whole Slow Juicer B6000S - Vertical Single Auger Juicer with 3" wide feed chute. PLEASE NOTE: the RED Model costs MORE than the WHITE and SILVER models because it includes a SMOOTHIE STRAINER attachment. Why the Kuvings Whole Slow Juicer? 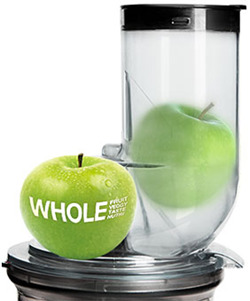 Healthier - Low speed extraction method - The Whole Slow Juicer presses and extracts juice instead of grinding, to retain all the nutrients and enzymes for a healthier, natural juice every time. Variety - Multi-purpose for a wide variety of food preparation and cooking - Extract vegetable juice, soy juice, fruit juice, home-made tofu and more with convenience and speed. Easy - Easy to Use and Easy to Clean. What more can you ask for? Fresh Tasting- No Juice separation for a smoother, better tasting, higher quality juice. Safe to Operate - Safety Overload switch protects against overloading and overheating and the Two-Step Safety Start System requires the juicer to be properly assembled or the juicer will not start. Convenient - Small Footprint on your counter top and Will fit under most kitchen cabinets due to slimline pusher. The Hand Grip allows you to easily move the juicer. Powerful - Powerful motor, no heat build up - The high powered, low speed motor is able to process very high fibrous fruits and vegetables. The unit stays cool due to the slow processing speed. Stylish -Stylish, compact vertical design - New concept design juicer conserves counter space and complements your kitchen decor. This juicer is designed as a juicer. With included attachment can make fruit sorbets and nut butters. For a limited time, get a special INTRODUCTORY discount when you order the Kuvings Whole Slow Juicer from DiscountJuicers.com. Please add this item to your shopping cart to see the special low introductory price. Juice Quality - in independent testing, juice quality has been found to be low pulp, high yield with a smoothness and consistency that is noticeably improved on the palate versus competing uprights. Patented technology - Unique Juicing Screw. Silent Operation - The Kuvings Whole Slow Juicer operates at 40-50 dB compared to the typical 80-95 dB of most high speed juicers. For comparison, a normal conversation is 60 dB, and a lawnmower is 90 dB. Any sound over 85 dB can cause hearing loss. Full Ultem Juicing Screw Auger and Screen - 8x stronger than other plastics used in brands without Ultem components. Brushless AC, Powerful motor - 240 Watt 3 squeezing HP equivalent with gear reduction, makes fast work of hard root vegetables. Two step safety start system - All parts must be assembled properly in the first step, with the second step of locking the lid that activates the power switch. Easy to Clean - For cleaning between juicing cycles, just pour water into the juicer and it will self clean, ready for juicing again. After juicing, the juicing bowl and base come apart easily for cleaning. Kuvings products are invented and designed to contribute to family's health. Kuvings products are manufacturered by NUC, a leading manufacturer of small appliances in Korea for over 30 years.